The Dollar/Yen has been trading within a very tight range since the start of the week, as traders are seeking safety in the US Dollar while the Japanese currency has turned unattractive following negative macroeconomic data and comments from BOJ's Kuroda, opening doors for additional stimulus. Earlier this morning, Japan released January’s National inflation up 0.2% YoY in line with the analysts’ expectation, market didn’t react to the news. Today, traders will focus on the FED’s monetary policy report for any dovish or hawkish signals. The Dollar/Yen is still bullish as the 50-day moving average is still acting as a strong support so far. Price action is telling us as if traders want to retest 111.10 (R1) once again. 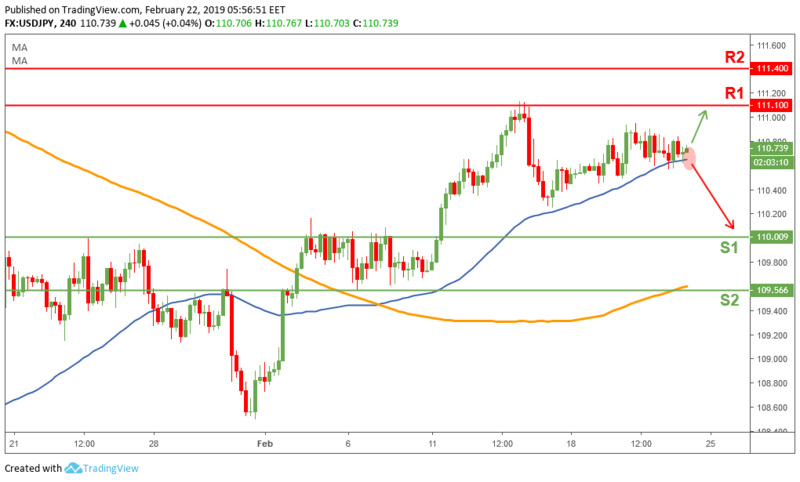 Price will find clarity and momentum once traders break above 111.10 (R1) or below 110.60 (Blue Line).